We all understand riding comes with risks. We also have no shortage of people telling us how risky motorcycle riding is. Here are the latest stats to keep in mind. We can’t eliminate all the risks, but we can reduce our exposure to them. That can be as simple as wearing proper gear, avoiding intersections as much as you can, and riding at certain times of the day. You’ll be surprised to know where most of the ‘bad things’ happen. Most are easily avoidable. Below is a quick summary of the stat reports and studies from The Virginia Tech Transportation Institute, U.S. Department of Transportation’s Fatality Analysis Reporting System (FARS), Insurance Information Institute, Wikipedia, and ICBC. Most of these stats are based in the USA and world. This is a far larger sample size than Canada has. When you decide to ride your motorcycle instead your car you are more than 27 times (some studies are higher or lower) more likely to die. Yikes! However, only five times more likely to be injured. Don’t be too alarmed about this number. Driving a car is not a guarantee of safety there were still 30,000 motor vehicle fatalities versus 4,500 motorcycle fatalities. The safest way to travel is still via airplane. In 34% of motorcycle deaths, the rider had a Blood Alcohol Level (BAC) of 0.01+. Any amount of alcohol puts your risk substantially higher. In 33% of motorcycle deaths, speeding was a factor. Motorcycles are capable of incredible speeds but is the rider capable of managing the speed? Probably not. In 28% of motorcycle crashes the rider didn’t even have a motorcycle license. Intersections are the worst place to ride. 72% (percentage varies slightly) of accidents are reported in intersections. Too many variables with many different rules to follow. Intersections are a fact of life in riding. Extra caution and picking a route with less intersections have potentially huge benefits. From 2005 to 2014, motorcycle fatalities among riders 40 years and older increased by 14%. This group is now the largest number of fatalities. The worst motorcycle to ride is a super sport motorcycle (1000ccs and smaller). They have a fatality rate four times higher than other motorcycles. The worst risk of riding is a male aged 30 and younger riding a super sport. This doesn’t mean you will crash but it means you have to be that much more careful. The worst time to ride a motorcycle is from 3pm to 6pm on any given day. Riding from 3pm to 12am represents 56% of fatalities and 58% of injuries. Almost half of motorcycle fatalities from 9pm to 6am had excessive Blood Alcohol Levels. The safest time to ride is from 9am to 12pm. When it comes to days of the week, the weekends and holidays are the worst times to ride. If you are still reading this far, good on you! There is no need to sell the motorcycle just yet. Here is the good news. From 2005 to 2014, the number of motorcycle fatalities (4,600 USA) have stayed the same yet there are 35% more motorcycle riders on the road. In the same time period injuries only increased by 6%. Better safety features, education, and motorcycle gear is changing the stats for the better. Are you a motorcyclist and do you drive a car on a regular basis? Great. You are 21% less likely to make a insurance claim driving your car versus those drivers who don’t ride motorcycles. Where you have increased your risk to yourself riding a motorcycle, you have decreased your risk in a car. Anti-lock Brakes (ABS) are 37% less likely to be involved in a fatal crash. Riders who ride motorcycles with ABS are 23% less likely to make a collision claim. There are 34% fewer rider injuries with ABS equipped motorcycles. A skilled motorcyclist with traditional brakes can stop faster than an ABS equipped motorcycle. The average motorcyclist does not have the skill (or skill in a panic situation) to stop the motorcycle efficiently. ABS motorcycles are better for the average and even above average motorcyclist. Whichever demographic you are in, you need to be smart and safe. Certain demographics will have to exercise greater care than others. The perfect motorcyclists ride smaller engine motorcycles equipped with ABS. They ride with full motorcycle gear. They take rider courses (beginner and advanced) from time to time. They do not drink and ride, ever. They don’t ride at night, or on weekends (including holidays) and avoid as many intersections as possible. Even this is not a guarantee for your safety but nothing in life is without risks. It is entirely up to you on how you control the risks of riding. Motorcycle riding can be quite safe. It’s your choice. Dr. David Kashmer is a Trauma Surgeon, Rider, and Author. He has been an attending trauma surgeon for 10 years. He has been riding for 12 years on a Suzuki c50. He is also the author of two books; Volume to Value: Proven Methods for Achieving High Quality in Healthcare & The Hidden Curriculum: What They Don’t Teach You At Medical School. David designs and builds high-quality healthcare systems using a data-driven approach. From preoperative care, to operation, to post-operative care, David takes the big picture approach to patients and hospitals. David is not your doctor so take this advice as is. He wants you to know that what follows is NOT medical advice, and you should consider your own health (and your doctor’s opinion) before deciding whether and how to ride. If you see the worst of motorcycling why do you ride motorcycles? What we see in the Trauma bay doesn’t necessarily indicate all the people and riders who are out there. In my opinion as a rider, riding motorcycles is all about risk and reward. People get all the information they want about riding and weigh the risks versus the benefits. People have the ability to decide what they want to do in their own lives. As a trauma surgeon, I realize I see a very select group of all the people that ride. I see the ones who get hurt. Sometimes I even see really significant injuries but, compared to how many people ride every day, overall they are unlikely for most people. Many motorcyclists I know ride for years and never have a problem. The important part is to get the information you need, decide whether to ride, and to manage your risk when you do. Are there any common themes with motorcycle accidents? The pattern injuries of injuries is really interesting. With sport bikes we see mostly head, facial and neck injuries. Even with full face helmets you can still get facial injuries. No matter how good the helmet is we do see facial fractures at times. With Cruisers we see more pelvic and lower extremity injuries. Often we see the femur [leg bone] push up into the pelvis into the pelvis at the hip. Sometimes, this makes the pelvis open up like an open book. Some trauma centers call those injuries Harley injuries when a motorcyclist comes in with them. In the trauma room can you tell if they were wearing motorcycle gear or not wearing motorcycle gear? It depends what part of the country you’re in. I work in the North East (Pennsylvania) and in Florida. It really is temperature dependent. The warmer climates mean less gear. Gear certainly helps but I would like to see more data on it. Helmets seem to make a big difference. There is a lot of evidence that helmets help. Interestingly, since seatbelts in cars became a requirement, we see WORSE injuries in motor vehicle collisions. We think this is because more people make it to the hospital alive than used to before seatbelts were required. So, although they are alive, the injuries seen in the trauma bay are worse. People who used to die don’t quite die and come to the hospital with worse injuries than what were seen before. I’m sharing this story because I wonder if motorcycle gear is the same: it may help keep you alive and so when you come to the hospital with gear we see worse injuries than people who arrive with no gear. The bottom line is gear probably protects us much better than no gear whether or not I can tell in the trauma bay if you had gear on. If you were to come in with gear and have worse injuries, I’d probably say without gear you would’ve died! Do you think news media makes too big of a deal on how dangerous motorcycling is? I do think there is a focus on times when motorcycling went wrong. People have the ability to decide risk and benefit themselves. Especially as long as they are not endangering anyone else. It is important to be educated about it, but sometimes I do think the spectacular, violent, or unsafe situations in motorcycling are the focus of the news media because they make for more attractive news. Do you believe that most of the accidents are rider error? I would have to see data on it but from my opinion it is more several things lining up to create a collision, including what is going on around them. Part of it is the weather, how good/prepared a rider you are, the cars around you…all these things have to line up. It is not just one thing. Of course, it is still on you to prepare for those situations. Is there an age group you see more of? First off it is almost all males. Rarely do we see a female. With males I see mostly ages 17-24 and then much older, late 50s and up. Older guys on touring bikes and younger guys on sport bikes. The younger riders recover fast, and in general we seem to get them through much more easily. The older riders take more time. How can we never see you or any other Trauma surgeon? The only way for complete prevention is abstinence from everything. You can’t own a motorcycle and no one else can. Other activities would need to be prohibited too, like no one can own a gun. No one could drive cars either… I’m saying all that because, bottom line: there is no way to completely insulate yourself from all risk in life. Now, all that said, you need to prepare to make the risk as low as possible that you will ever need to meet me. The best way to avoid me is training and expertise. Don’t be intoxicated, not even buzzed. Anything that would decrease reaction time, stay away from it. Taking a motorcycle safety course really helps too. If we get hurt, how can we get healthier, faster? It is very injury specific, but there are some things that are common no matter what injuries you have. Physical therapy and rehabilitation is significant. Compliance with the regimen that we recommend to you as much as possible is also really important. It can be tough. We commonly see patients missing some medications, for example. It’s hard to keep track of them. So it is a great reliance on you to follow the regimen. Are there specific times you deal with motorcycle injuries? From my experience, Friday nights and weekends we seem to get more motorcycle related injuries. We certainly do see a lot more motorcyclists on sunny days and during the summer. Knowing what you know now what would tell yourself before you learned to ride? I would have bought a lighter, smaller bike when I was starting. It would have made it easier to learn. 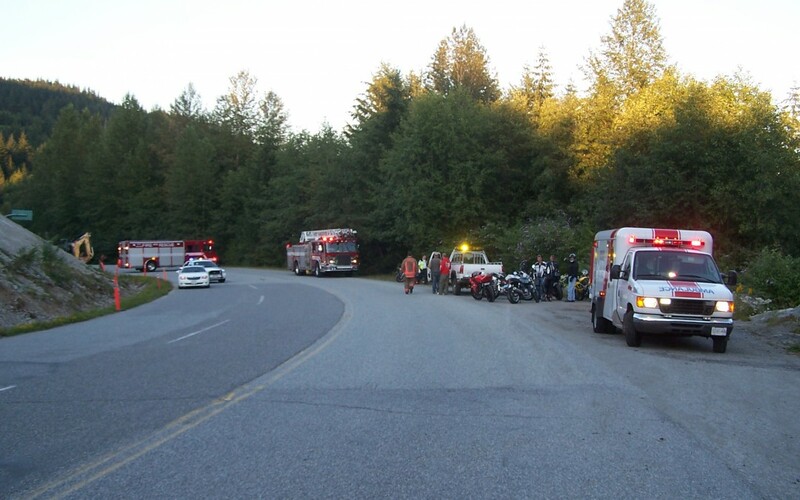 Paramedics are the first responders to motorcycle accidents. The motorcycle stats we currently have don’t go far enough. Going right to the source will identify further measures we can use for safety. My research is early with Paramedics so I definitely need to talk to more Paramedics, Fire Fighters, Police, etc. If you can help, please email me at lee@1stgear.ca. The questionnaire I ask about any common themes and easily identifiable problems that potentially could be avoided.